1. Master's student, Wendy Leunberger, takes measurements following a simulated ice storm experiment at the Hubbard Brook Experimental Forest. 2. Scientists create a simulated ice storm at the Hubbard Brook Experimental Forest, NH. Snapshot : Extreme weather events are becoming increasingly common, creating dangerous disturbances to forests, towns, and cities. 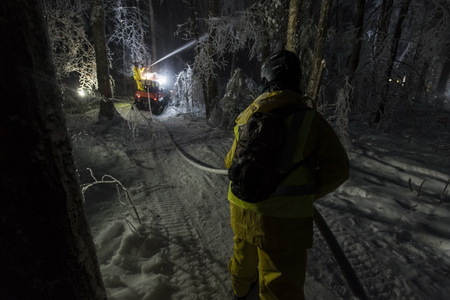 Forest Service scientists are pioneering new approaches to study these hazardous events with the long-term goals of making future forests and communities more resilient. Ice storms are a common natural disturbance that can cause massive damage to north temperate and boreal forests worldwide. Because of the unpredictable nature of ice storms and difficulties in forecasting their occurrence, most past investigations of the ecological effects of ice storms have been based on case studies following major storms. During the winters of 2016 and 2017, Forest Service scientists at the Hubbard Brook Experimental Forest in New Hampshire took a novel approach and created a suite of experimental ice storms in a northern hardwood forest. The icing treatments included targets of one-fourth, one-half, and three-fourths inch ice coating on tree branches sprayed in the winter 2016 to evaluate the impacts of different intensities of ice storms. In the winter of 2017, trees were sprayed with a one-half inch coating of ice to evaluate the impacts of consecutive ice storms. Early results show that the ice storm created gaps in the tree canopy and deposited large amounts of woody debris to the forest floor but had surprisingly little impact on soil processes. The ultimate goal of this study is to provide information to stakeholders, such as utility companies, forest managers, and arborists, so that they will be better prepared to respond to big storms.